Model no. 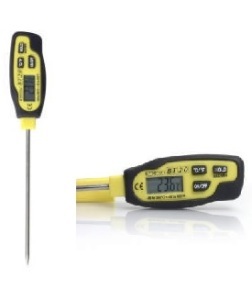 BT20 manufactured by Trotec,Germany is an insertion thermometer with a needle. The user can insert the needle into the material for which the temperature need to be measured. Typical applications are for measuring the temperature during food processing, food storage etc. 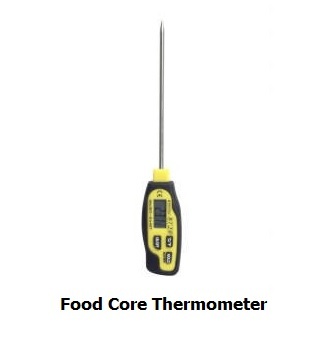 As it is used for measuring the temperature deep inside, it is generally known as food core thermometer. 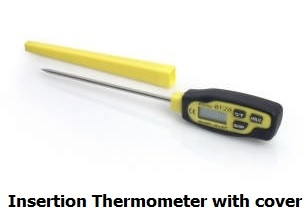 Various other terminologies used for the same are probe thermometer, insertion thermometer, penetration thermometer etc. Quick and easy core temperature measurements. Wide measuring range from -40°C to 240 °C. Maximum or minimum value and hold function. Measuring range in °C is from -40°C to 240°C. Measuring range in °F is from -40°F to 482°F. The accuracy of reading is 0.1°C or 0.1°F. Resolution of reading is 0.1°C or 0.1°F. Response time is 2 seconds. Display type is LCD screen. The power supply is by an internal battery of AAA size. The weight of this insertion thermometer is 40 grams. The following major functions are available through buttons near the display screen of the probe thermometer. Switch between °C to °F and vice versa. Maximum value displays on the screen. Minimum value displays on the screen. Auto power off after a time delay. The BT20 contact thermometer is ideal for not only measuring the temperature of your favorite Sunday roast but also a variety of different applications in the catering trade, laboratories, trade and industry as well as professional and hobby kitchens. The long, slim, stainless steel measuring tip and the wide measuring range from -40 °Cto +250 °C make this practical insertion thermometer ideal for a variety of measuring applications in gastronomy, trade, craft and industry, as well as in laboratories and for hobby enthusiasts.The BT20 is equipped with a long, thin stainless steel needle which determines the core temperature in only 2 seconds. The plastic housing of the BT20 can be cleaned easily and is fitted with both a rubber, soft-touch, protective cover for exceptional grip and also a splash guard. Because the BT20 is so hygienic to use it is excellently suited for inspections in the food processing industry and for food inspectors who appreciate an easy and efficient means to determine the core temperature of different foods in conformity with HACCP requirements.